Originally from Scotland highlands as far back as the 16th century has a very similar look to the Scottish Terrier and the West Highland White Terrier. In fact these two breeds plus the skye terrier (all non shedding dogs) are all likely to have contributed to the gene pool of the Cairn Terrier. Only by the 1900’s was the Cairn Terrier officially recognized as a unique breed. They are named after piles of small stones that were used to mark graves and Scottish farm borders. The reason being that they were tasked with the job of keeping these stones vermin free. 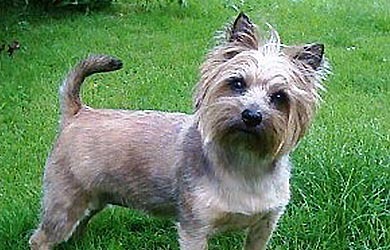 In appearance the Cairn Terrier looks like a hardy wiry dog with a fox like face. It has a compact body with strong bones. It has similar characteristics to many terriers: loyalty, hardiness, curious and friendly. Also like other terriers they are great with children, as long as their owners train and discipline them correctly. Because of the hunting nature of these dogs, daily exercise is mandatory to get the best health and socialization from them. Cairn Terriers can also quickly gain weight, so a strict diet and exercise regime makes sense. If bored these ratters can do plenty of destructive digging and barking – so it is wise to re-direct their boundless energy into performing tricks and playing with other energetic dogs. You will have to be particularly strong around any areas where they may find the scent of rabbits or other vermin as their chase orientation often overrides any training you may have applied. Cairn Terrier Grooming: These dogs have a strong shaggy wiry coat that needs several brushes minimum per week to avoid tangles. If you regularly brush, it will be much easier to de-tangle the soft undercoat. The Cairn Terrier’s thick double coat consists of a shaggy outer coat and a soft, dense undercoat that maintains body temperature in cold climates. The coat can be colored: brindle, black, sand, or grey. To maintain oils, bathing is recommended only once a month, followed immediately with brushing before the coat dries. Maintaining shorter hair around the eyes and ears is recommended as is monthly nail trimming. ← Brussells Griffon, hunting dog or cute pet?